According to Apartment List.com, rents for one bedroom apartments in Portland have declined 3 percent in the past year. It’s a solid vindication of the standard predictions of economic theory: adding more supply (building more apartments) helps drive down prices. Just a couple of years ago, Portland experienced some of the fastest rental increases in the nation, with average rents, according to some indices, rising at double-digit rates. Alarm about the rent crisis prompted the City Council–unwisely, in our view–to adopt one of the nation’s most stringent mandatory inclusionary zoning ordinances. As we’ve chronicled at City Observatory, that ordinance prompted a land rush of building permit filings in January of 2017, as developers looked to lock in building permission before the new ordinance took effect. That surge of building permits came on top of several strong years of new apartment construction. 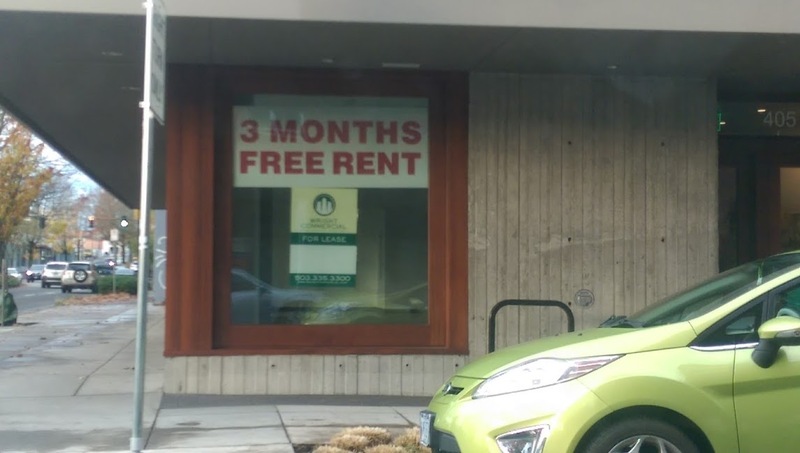 The result has been a flurry of “For Rent” signs, the like of which Portland hasn’t seen in years. Landlords are notoriously loathe to cut advertised rents, but in addition to tolerating longer vacancy periods, there’s evidence that there’s considerable discounting going on in the local marketplace, with landlords offering one- or two-months free rent, waiving fees and deposits and even offering pre-loaded debit cards. An apartment building on NE Martin Luther King Blvd, Portland. 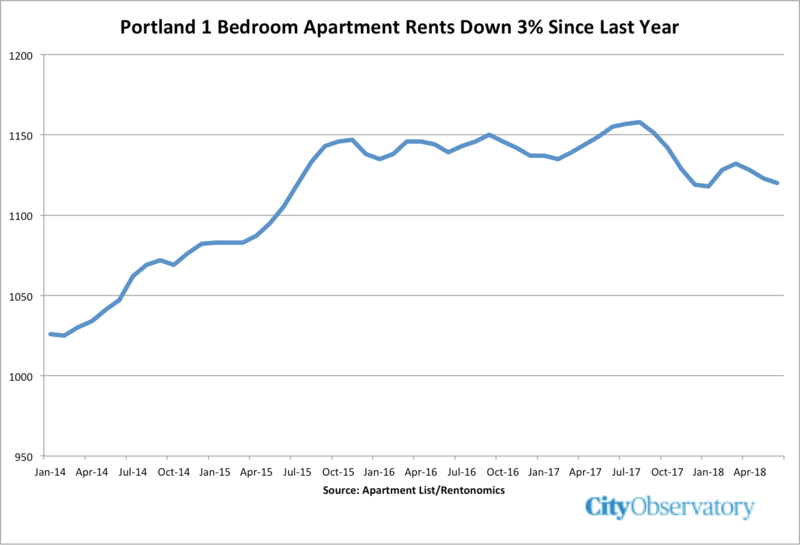 But the latest report from Apartment List shows that the average level of rents being paid in Portland has actually declined. In the past year, the benchmark rent for one-bedroom apartments has fallen from $1,155 to $1,120, a decline of 3 percent. (While we’re skeptical of the accuracy of many published rental price indices, ApartmentList.com’s is one of the good ones, using a “repeat sales” method that provides robust estimates). With lots more apartments under construction, it’s likely that the supply will continue to increase over the next year or so, driving up vacancy rates, and putting further pressure on rents. As we’ve argued at City Observatory, the market works, but with a lag. There’s a temporal disconnect in the housing market. Demand can change quickly (growing as incomes rise and new residents move into the region), but supply changes only very slowly (thanks to the time it takes to round up financing, navigate the permit process, and then actually build something). After lagging well behind demand in the early post-recession years, housing supply has finally caught up, with the predictable effect that rents have flattened out, and now clearly started to decline. The big question going forward is whether Portland’s inclusionary zoning requirements will stifle the surge in new apartment construction. While the pipeline is, for the moment, full of projects that were pushed forward to beat the IZ deadline, those will mostly be built in the next year or two. Since the inclusionary zoning ordinance went into effect nearly a year and a half ago, new apartment proposals have slowed to a trickle. There’s now abundant evidence that the market is working. Policy makers would be wise to take a close look at these data, and aim to continue and accentuate this trend. Putting the city’s inclusionary zoning requirements on hold would be a good first step. In addition, it’s widely assumed that the 2019 Oregon Legislature will be asked to legalize rent control: that would be a step in the wrong direction.